Does an armed plebiscite constitute an ethical tool of democracy? The victory of the rebels in Libya (August 2011) calls to mind the old controversy about revolution, and whether citizens can rightly rebel against their long established government. Insofar as the revolt against Muammar Gaddafi escalated into six months of civil war, Libya (as distinguished from other countries experiencing an “Arab Spring”) offers a sort of laboratory test on the issue of whether it is morally justifiable for a citizen to take up arms against a corrupt regime. It might be, therefore, that Christian moral teaching on the subject of revolution will begin to receive a somewhat more favorable reception in countries like Libya, despite their Muslim majorities. In any event, Catholic doctrine is universal. And in the case of the catechetical preconditions for armed insurrection, they comport with common sense applicable to people of every tradition. Thus, it can be counter-evangelical when pro-government or pro-statist writers invoke the Christian religion. In his Which Jesus: Choosing Between Love and Power (2002), Protestant writer Tony Campolo sees St. Paul’s epistle, Romans 13, as condemning all revolutionaries who dare to take up arms. Campolo equates such rebels with Barabbas. But precious few practicing Catholics would, I suspect, agree. To become Campolo’s disciple would require a sort of de-canonizing of St. Joan of Arc. No doubt Campolo and most of his followers would indignantly resist comparison with Reich Bishop Ludwig Muller and his German Christian Movement, 1933-37. And yet these ostensible Christians became Nazi accomplices by maintaining that Romans 13 mandated submission to the Fuhrer, Adolph Hitler. Their theology stood in stark contrast to German Protestants like Dietrich Bonhoeffer, and German Catholics like Cardinal Clement von Galen of Westphalia, who resisted the regime of the Third Reich with a will. At great personal risk they trusted in God’s mercy – little fearing damnation for daring to defy the tyrant. …Here the apostle (St. Paul, Romans 13) argues the duty of a cheerful and conscientious submission to civil government, … as the design of it was to punish evildoers, …. But how does what he here says, prove the duty of a cheerful and conscientious subjection to those who forfeit the character of rulers? to those who encourage the bad, and discourage the good? The argument here used no more proves it to be a sin to resist such rulers, than it does, to resist the devil, that he may flee from us…. Thus, upon a careful review of the apostle’s reasoning in this passage, (Romans 13:3-4) it appears that his arguments to enforce submission, are of such a nature, as to conclude only in favor of submission to such rulers as he himself describes; i.e., such as rule for the good of society, which is the only end of their institution. Common tyrants, and public oppressors, are not entitled to obedience from their subjects, by virtue of any thing here laid down by the inspired apostle…. Catholics still concerned about Romans 13 might notice how frequently our altars bear the imprint of the chi rho , the insignia which Constantine inscribed on his Roman soldiers’ shields at the Battle of the Milvian Bridge, 312 AD. Constantine’s Edict of Milan the following year, marked a blessed turning point in salvation history, well worthy of honoring in our churches. Following up on such Thomistic teaching, the Catechism of the Catholic Church, 2243, indicates that if five conditions are met, then armed insurrection can be justifiable and morally defensible. This provision was included in the Catechism, first issued under the signature of John Paul II, only three years after the downfall of European Communism in which he played such a key part. Especially in Poland, the great Pope was – with Ronald Reagan and Lech Walesa – a leading instigator in overthrowing the dictatorship. Some commentators are already comparing the revolts of the Arab Spring to the revolutions of 1989 in Eastern Europe. Poland two decades ago, like Tunisia this year, sparked a spreading series of revolutions against Marxist regimes. Let me conclude, therefore, with the five catechetical preconditions for armed resistance to one’s government. I shall attempt to apply them to the armed revolt against Muammar Gaddafi’s regime in Libya. Seeing whether and how they apply will elucidate these principles by bringing them out of the abstract. Crosschecking between theory and this year’s reality in Libya might also help clarify the doctrine as regards any future armed revolutions in the Middle East — say against Assad in Syria, or (as some might wonder) against postmodern forms of tyranny in the West. 1. Certain, grave, and prolonged violation of fundamental rights. 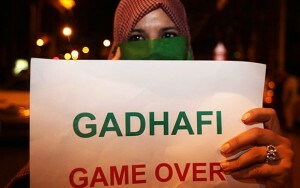 These violations have been a longstanding feature of the Gaddafi regime during the 41 years of its dominion in Libya. In 1996, for example, an uprising at Tripoli’s Abu Salim Prison took place in response to poor treatment of the prisoners, many of them students arrested for an earlier protest against Gaddafi’s misrule. Instead of addressing the grievances, the government had some 1200 of the inmates systematically executed, cell block by cell block. A volume could be written on the violation of fundamental human rights under Gaddafi. Two instances from 2009 are revealing: CNN reported in March of that year that four Korean Christians had been arrested and tortured for attempting to spread the Gospel to Libyan citizens. At the end of 2009 Human Rights Watch indicated in its annual report that “repressive laws continue to stifle speech,” in Libya and that “abuses by the Internal Security Agency remain the norm.” Just on the basis of injurious practices predating the 2011 revolution, and not counting atrocities committed by the government since the protests began in mid-February of this year; it is apparent that the first catechetical condition was no reproach to the Libyan rebels. 2. Other means of redress have been exhausted. To be sure, popular resistance must be tempered by longstanding rules of warfare. Indiscriminate killing of civilians is never justifiable, and the fact that Gaddafi presided over a terrorist regime would not have justified the rebels had they responding in kind. 3. Will not provoke worse disorders. Is life so dear or peace so sweet as to be purchased at the price of chains and slavery? Forbid it Almighty God. I know not what course others may take, but as for me give me liberty or give me death. The other side of the coin involves predicting, or rather calculating the future. But who besides God really knows the future? And so moral culpability for miscalculating what degree of disorder an insurrection will provoke would depend on capacity – not on the eventual outcome, but on the moral, political, and intellectual resources available for such a calculation. The Koran lacks anything like the two Books of Maccabees to provide moral guidance re popular insurrection. And politically, the resources available to denizens of the Middle East have been stultified for many years, even generations. All the more miraculous, then, if the Libyan resistance managed to choose the optimum course of action. Another consideration is whether consequences are long-term vs. short-term. During the American Revolution disorders worsened for several years, but after the Battle of Yorktown (1781) things got better for the nation as a whole. Similarly during the Texas revolution (1835-36): At first things got worse (massacres at Goliad and the Alamo), but after San Jacinto they turned out for the best. Consequences can also be subdivided into political, economic and cultural categories. The more catechetical proviso #3 is scrutinized, the more daunting it becomes to calculate, and the more pertinent Albert Einstein’s comment that “politics is more complicated than physics.” I’m not sure that as recently as last month Pope Benedict XVI himself could have issued a definitive forecast on whether the armed insurrection would eventuate in worst disorders. Insofar as Sacred Scripture and salvation history hold the Maccabees up as a model of virtuous service to God and country, we need a nuanced response when we encounter the argument that “insurrection could well lead to oppression.” It would be theologically unsound to suppose that God opposes all high-risk revolutions. For whether oppression by the regime is the greater evil compared to disorders deriving from insurrection is an evaluation that depends, surely, on whether the derivative disorders will be long-term or short-term. If we take Moses and the Maccabees as Biblical case studies on insurrection, then it may be that risking short-term disorder gets morally outweighed by long-term prospects. At this writing it looks very much like the rebels in Libya made the right choice. They did face a close call in mid-March while Gaddafi’s troops were advancing on Benghazi from the east. It looked like the rebellion might be crushed, followed by a humanitarian disaster on the order of Rwanda. Such fears were averted just in the nick of time, thanks to NATO fighter jets which began enforcing the UN Security Council’s no fly zone. Resolution 1973 authorized “all necessary measures,” including air strikes, to protect civilians from the regime’s aircraft, tanks and other heavy weaponry. A factor in favor of the Libyan rebellion was the vast oil resources in play. The provisional government did, in fact, use oil as a bargaining chip for foreign assistance on economic grounds, as well as humanitarian considerations. There was no shortage of incentive or of precedent for the NATO intervention. All along the North African coast, European powers have quite an extensive history of military and economic involvement. I believe we may confidently say that from the outset in February, armed resistance to Gaddafi’s provocations offered some well-founded hope of success. But there was plenty of risk and no certainty of victory. As it turned out, vast numbers of Libyans took the leap of hope and braved the risk, and in August their initial hopes were realized in spectacular fashion. Nor was the victory a mere decapitation, as in Tunisia and Egypt, where Ben Ali and Hosni Mubarak were ousted, but their reformed regimes held on to power. By contrast, the Libyan regime has been routed. The 33 member National Transitional Council which has been headquartered in Benghazi represents a clean break, in that no whitewashed version of Gaddafi’s rule remains (although his estranged ex-Justice Minister, Mustafa Abdul Jalil, is chairman of the NTC). Are acts of desperation incompatible with “well-founded hope?” One of history’s earliest insurgents, Moses, is honored in Islam as one of the seven prophets. Moses led a revolution that, by human calculation at least, might have looked risky to the point of recklessness. Except for the promise of miracles in which Moses firmly trusted, the exodus must have seemed like the antithesis of any “well-founded hope of success.” It didn’t take a military genius to see that Pharaoh’s army could easily crush the exodus when they were backed up against the Red Sea, and return the survivors to servitude more onerous and oppressive than what the Hebrews had already suffered. The revolution of 1821-1832, A.D. by Christian Greeks against their Turkish oppressors was a doubtful enterprise from the start, and costly to both sides in blood and economic prosperity. At the onset of the revolution, the top Christian Orthodox cleric, Patriarch Grigorios of Constantinople, excommunicated Alexander Ipsilantis, the military leader of an early attack against the Ottomans. In addition, the Tsar of Russia, a fellow Orthodox Christian to whom the Greeks had looked hopefully for support, disavowed the revolutionaries for raising false hopes among the people. Despite all the pessimistic predictions from “people in the know,” Greek insurrectionists did in fact win. And the victory came in such extraordinary ways (partly through the timely conjunction, October 1827, of the British, French and Russian fleets) that contemporaries attributed Greek independence to divine intervention in history. Indeed there are echoes of 1827 in NATO’s military action of 2011. The developments in Libya, like the events in Greece eighteen decades earlier, instruct mankind in the ways of Divine Providence. They constitute historical schooling on how the phrase, “well founded hope of success,” is more than just a calculation based on probability theory. Evidently the great Helmsman of history is sometimes willing to favor a long shot when it is founded on justice. Might a seemingly wild political gamble find providential favor? In Ireland the Easter Rising of 1916 offered no hope at all in the short-run. The leaders had no expectation of military victory; they admitted it was impossible from a practical standpoint. But the armed rising in Dublin was a dramatic gesture, a blood sacrifice to boost national morale. It was intended to restore the country’s honor via the moral effect of boldly defying British rule. It proved that the nation still had citizens who considered her worth dying for. Within six years (again, the long-run vs. the short-run) Ireland had won her independence. 5. Impossible reasonably to foresee any better solution. The fifth point on perceiving no better course of action is similar to the second on having spent all other options. Both come down to a decision by process of elimination. Once Gaddafi began shooting down his own people, it became useless for resistors to keep searching for solutions other than armed self-defense. “There is a point at which forbearance ceases to be a virtue” (Texas’ Declaration of Independence, 1836). There is always servile submission, of course. But neither common sense nor the cardinal virtues require that when push comes to shove, oppressed peoples must bow in abject surrender. In conclusion, paragraph 2243 may be summarized as follows: The first two provisos are verifiable preconditions, i.e. longstanding governmental oppression, accompanied by exhaustion of all non-violent means for reform. Without these prerequisites, armed resistance to a regime is unjustifiable. To these preconditions, the Catechism adds a triad of prudential mandates, the crux of which is that we must look to the future and deliberate carefully about our prospects. No armed insurrection is justifiable without “spes fundata” (firm hope) that the rising will eventually do more good than harm. Sometimes such hope derives from experience. On the eve of Lexington and Concord, Patrick Henry put it thus: “I have but one lamp by which my feet are guided, and that is the lamp of experience. I know no way of judging of the future but by the past.” Looking back on the extraordinary developments of this year’s Arab Spring, I submit that the Libyan rebellion is indeed a hopeful sign.